protects and helps them in their woes. 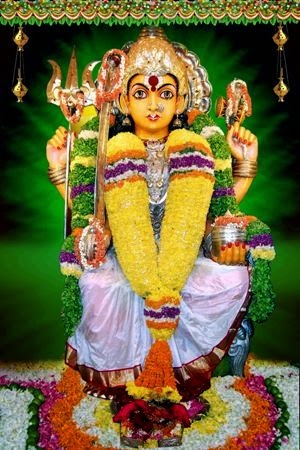 The desires of the devoties are fulfilled by worshipping the goddess Sri Nookambica Ammavaru. Sri Sri Sri Nookambica Ammavari temple was taken over by Endowments department in the year 1935. Funds of this temple are contributed for renovation of temples from godavari districts to berhempur district. Now this temple is under the control of endowments department (act 30/1987 6(2)(ii) and an officer in the cadre of assistant commissioner is appointed as executive officer. Now the income of the temple runs to a tune of 68 lakhs per year. The temple building and premises with coconut trees and vegetation looks very beautiful and attracts devotees. With the contribution of donors new cottages were constructed and also roads were laid to reach the temple. Now the devotees feel happy to visit the holy temple. There is a provision for performing poojas on the required day by the devotees who pay the prescribed fee of Rs 1116/-. The said amount can be paid in cash or sent by money order or though a demand draft. Prasadam will be sent to such devotees by post after performing poojas in their names and gotrams. Special poojas will be performed in the name of the devotees duly collecting the prescribed fee from the devotees.